The Supreme Court on Thursday stayed its February 13 order in the wake of which over 11 lakh tribals and other forest dwellers in 17 states stood to be evicted. 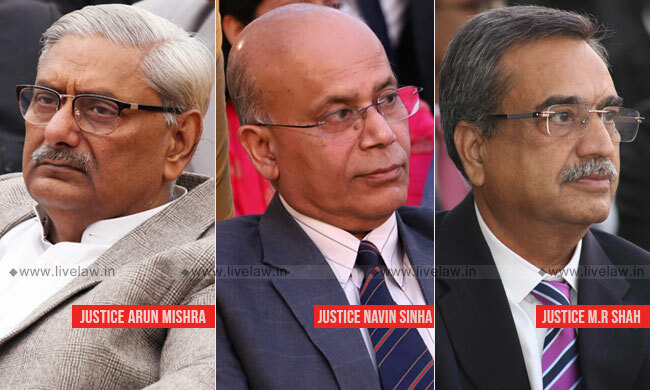 The bench headed by Justice Arun Mishra also required the Chief Secretaries of the states to disclose the modalities of the procedure of adjudication of these claims on forestland. Noting that many of these claimants may not even possess the requisite documents, the court directed the states to furnish whether the rejections were made after following due process, if there was adequate communication with the evictees at all stages, and whether there is acquiescence of the State-level Monitoring Committees which ensure that no tribal is displaced except in compliance with the formalities under the Scheduled Tribes and Other Traditional Forest Dwellers (Recognition of Forest Rights) Act, 2006. Emphasising the need for forest conservation, the bench wondered if the persons encroaching on the forests are in fact traditional forest dwellers. That The undeserving masquerading as tribals cannot be permitted to occupy forestland, was the view of the court. Solicitor General Tushar Mehta, who had urgently mentioned the Centre's application on Wednesday, insisted that the rights of these inhabitants of the forests cannot be sacrificed on account of forest preservation and that the two must exist in harmony. "The Act of 2006 only envisages an examination of the claims and not eviction...under the Act, the rejection of a claim does not ipso facto lead to eviction of a tribal. There is no provision in the Act which provides for eviction after a claim is rejected", it was submitted. "You have been in a slumber all this while, and now after we passed this order, you are seeking a modification? ", the bench, also comprising, Justices Navin Sinha and M. R. Shah, reprimanded the Ministry of Tribal Affairs. It may be noted that it was back in 2016 when the court had directed the states to file details of the rejection of claims and the follow-up action. On behalf of the Centre, it was urged That to deprive the poor and illiterate tribal people of the forests which have been their home for generations without heeding the principles of natural justice and an appropriate platform for appeal would be seriously prejudicial. Staying its order, the bench granted four months to the concerned states to do the needful. The matter will now be heard in July. On February 13, the bench of Justices Arun Mishra, Navin Sinha and Indira Banerjee directed states to ensure the eviction of all those persons from forestland whose claims under the Forest Rights Act have been rejected. The Chief Secretaries of Andhra Pradesh, Assam, Bihar, Chattisgarh, Jharkhand, Karnataka, Kerala, Madhya Pradesh, Maharashtra, Odisha, Rajasthan, Tamil Nadu, Telengana,Tripura, Uttarakhand, Uttar Pradesh and West Bengal were told to explain before Court why the rejected claimants have not been evicted. They were directed to ensure eviction in all cases where rejection orders have been passed on or before July 24. "In case the eviction is not carried out, as aforesaid, the matter would be viewed seriously by this Court", the bench had sternly warned the states. In the application moved yesterday, the Centre sought modification of the order so as to direct the State Governments to file detailed affidavits regarding the procedure followed and details of the rejection, and to withhold eviction till then. The Centre told that court that it is uncertain from the affidavits already filed by state governments as to whether the rejection orders were passed after due process, and whether appeal mechanisms have been properly exhausted. The Centre said that it has been periodically monitoring the implementation of the Act by the state governments. It has noted high rate of rejections of claims, which are mostly due to wrong interpretation of the Act. There is lack of awareness about the procedure for filing claims among grama sabhas. In many cases, reasons for rejections were not communicated to the claimants, and they are not able to prefer appeals, the centre states in it affidavit. The Center referred to several letters sent by it to state governments in past years expressing its concern at the high rate of rejections, and unrealistic timelines followed by Monitoring Committees under the Act. It has also noticed instances where forest authorities were trying to evict tribals without awaiting the decision of appeal. "under the Act, rejection of claim does not ipso facto lead to eviction of a tribal. There is no provision in the Act which provides for eviction after a claim is rejected", the application read. "the applicant respectfully states that the Act is a beneficial piece of legislation and deserves to be construed liberally in favour of the FDSTs and OTFDs. The FDSTs and OTFDs are extremely poor and illiterate people and not well informed of their rights and procedure under the Act. They live in remote and inaccessible areas of the forest. It is difficult for them to substantiate their claims before the competent authorities. The applicant has time and again attempted to sensitize the state governments while deciding their claims.However, notwithstanding, it has come to light that the claims of FDSTs and OTFDs were rejected in a summary manner where no due opportunity is provided to the claimants. The rejection orders are not communicated or the same are without reasons. It is also noted that in certain cases, eviction orders are issued even before the appeals under the Act are exhausted". the centre stated in the application. The eviction direction came in a batch of petitions filed by an NGO Wildlife First and few retired forest officials, challenging the validity of Forests Rights Act. According to the petitioners, the Act has led to deforestation and encroachment of forest land. The petitions filed way back in 2008 also sought recovery of forestland from possession of those persons, whose claims under Forests Rights Act stood rejected. According to them approximately 20.5 lakh claims were rejected out of 44 lakh claims across states. "If the claim is found to be not tenable by the competent authority, the result would be that the claimant is not entitled for the grant of any Patta or any other right under the Act but such a claimant is also either required to be evicted from that parcel of land or some other action is to be taken in accordance with law", the Court had observed on January 29, 2016 in the case, before directing the states to file affidavits showing the status of claims. IMadhya Pradesh has the highest number of rejected claims, which approximately come to 3.5 lakhs, followed by Odisha, with nearly 1.5 lakh rejected claims. Uttarakhand has the least number of rejected claims, 51.